We’ve had a busy week, with seven students completing relief carvings. Richard came from Lostwithiel as a surprise birthday present along with Corrina and Dave who were visiting from Cambridge. 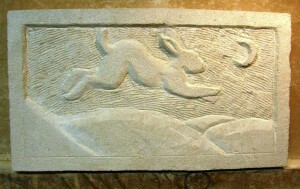 Richard’s composition of a leaping hare and crescent moon is particularly lively, a really lovely piece to take home. Over the weekend, father and daughter team Tim and Liz joined us from their holiday accommodation nearby. Liz made an abstract art deco piece, following a similar design to one Corrina had used earlier in the week. Tim brought a photo of one of the floor tiles from St Bartholomew’s church in Lostwithiel, and transformed this into a very effective composition. Finally on Sunday we had the company of Vicki and Stephen from Cheshire, who are on their honeymoon in Cornwall and Devon. Vicki has just qualified as a primary teacher and is looking forward to sharing her enthusiasm for art. She chose a snowdrop design and took to carving like a real natural. Having carved the outline of the design, Vicki had time to further enhance her piece by creating depth, especially on the leaves, which achieved a very satisfying result. There are images of Vicki’s work in our students’ gallery.